NASHVILLE – Tennessee Gov. Bill Haslam today rolled out a comprehensive statewide campaign designed to inform Tennesseans about the consequences of violating the “I Hate Meth Act,” which took effect on July 1, 2011. The announcement took place in coordination with the Tennessee Sheriffs’ Association meeting in Nashville. The “Meth Stops Now” campaign is an action step in the administration’s public safety action plan and specifically addresses the portion of the anti-meth law that increases the penalties for making or using meth in the presence of children and for purchasing pseudoephedrine products for non-medical uses. The communications campaign targets the counties in Tennesseewhere there have been the highest number of children removed from homes due to meth-related incidents and the greatest number of meth lab seizures. In 2011, the Department of Children’s Services removed 321 children from their parents’ custody due to meth use or manufacturing. Law enforcement officials also seized 1,687 meth labs in Tennessee last year, the second highest number in the nation, according to the Tennessee Meth Task Force. The governor also announced $750,000 in his budget amendment for the Tennessee Bureau of Investigation to assist local governments with training and equipment costs related to meth clean-up. This funding was originally appropriated for the current fiscal year but required matching funds from local governments of 25 percent. The current budget proposal eliminates the matching requirement. 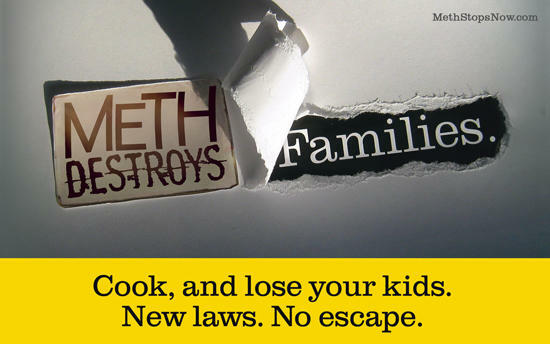 Created by the Tombras Group, the anti-meth campaign is funded by the Department of Finance and Administration’s Office of Criminal Justice Programs through a grant from the U.S. Department of Justice’s Bureau of Justice Assistance, Office of Justice Programs, and by the Consumer Healthcare Products Association. It includes radio public service announcements, billboards, gas pump advertisements, in-store signage, informational pharmacy bag fliers, a website (www.methstopsnow.com), and bumper stickers for law enforcement vehicles. Partners in the effort include the Department of Safety and Homeland Security, Department of Children’s Services, Tennessee Meth Task Force, Tennessee District Attorneys General Conference, Tennessee Association of Chiefs of Police, Tennessee Sheriffs’ Association, Tennessee Pharmacists Association, and the Consumer Healthcare Products Association.